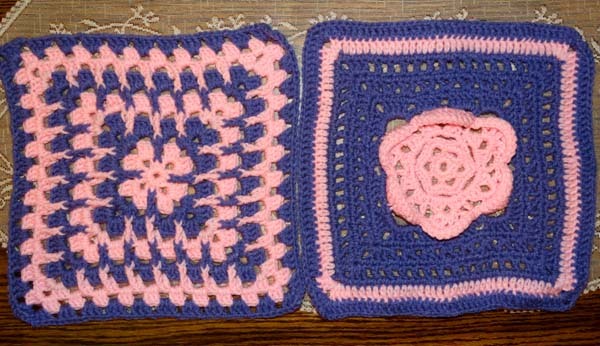 Please let me know if you need more squares-I'd like to help if you do! I think I have 3 people that have sent some so let me see what I have once they get here and then I can let you know. Thank you!!! 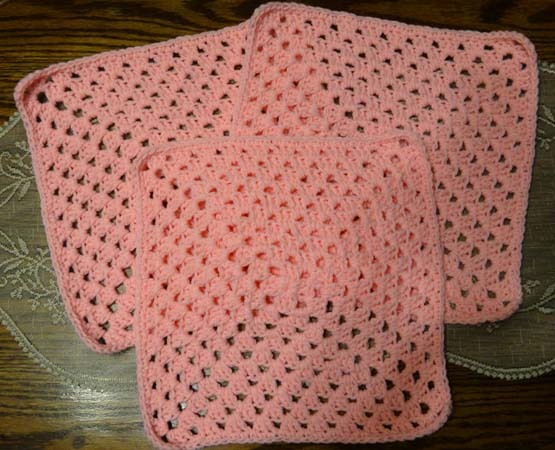 Three more squares from yarnscrapper... and such nice squares! Thank you!!! WOW, you got them fast! I hope they work for you! I got 2 more squares yesterday in the mail.. from bgs. Thank you so much! I teased her I am a horrible person... I love the treble one so much, I want to keep it. lol! That brings the total to 17 so far. Only 3 more to go. Thank you all so much. I've bought the soft white and need to figure out what order to place them in. I appreciate you guys. My sis in law is going to love it. She's been under so much stress lately, she had to go in yesterday to be fitted for a heart monitor. She's my age so only 42... I think it's mainly stress. Can't wait to send this to her a I'm sure it will touch her heart. You can do what I did when I made one. I laid them out on the floor and kept moving them, till I got them the way I wanted them. You got some very beautiful squares. This is going to be one very pretty afghan. Let us see it when it is done. Good idea on laying them out. 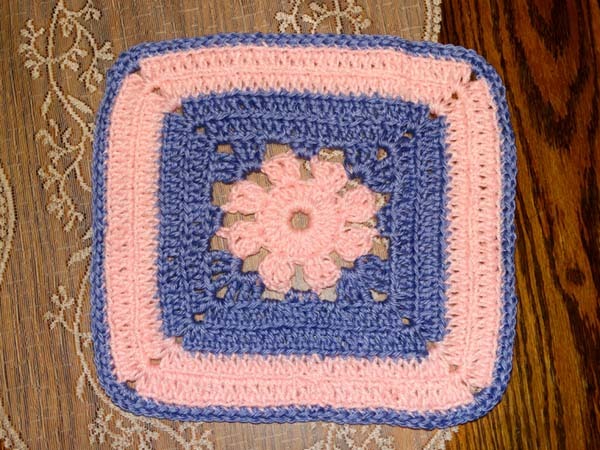 I'm just afraid I'm not going to do the beautiful squares justice in putting it together. I will definitely post a pic when I get it finished. If you still need some, I need to go to the post office later this week and will send some. Becky, I'm sending you a pm. Katy is sending one and mamamiaow is sending one so that will be it. Thank you!!! I'll post pic of it completed. Received mamamiaow's square and it's as beautiful as the rest. This is going to be a stunning comfortghan thanks to all of you ladies. I've got it laid out besides the last 2 squares. I hope to start putting it together this weekend.. but no worries as I left places for the 2 so it will work. Katie and Becky, I could have sworn I posted on here about your squares arriving but can't find it now. :/ So sorry about that. I did receive them and I have got the afghan put together. Thank you all so very much. It turned out beautifully even with it being the first time I put one together with different squares. lol It will be on the way in the morning to my sister in law and the timing is just right as she posted on facebook today, she was having a rough day missing her mom and brother. I have added a tag to the back of each square with the makers first name and city/state so she will know where they are from and that people from all over care and were thinking of her. Thank you all again so much. Nice job putting it all together! You are a great SIL. Looks wonderful even tho I don't see my squares in it? Might just be the angle of the camera or maybe you couldn't use them all. Know she will love it and appreciate all the work you've put into it! I actually took the pic from the side so I could tiptoe and get them all in the pic. Very cool looking afghan. She should love it and I hope you told her, it is full of hugs. 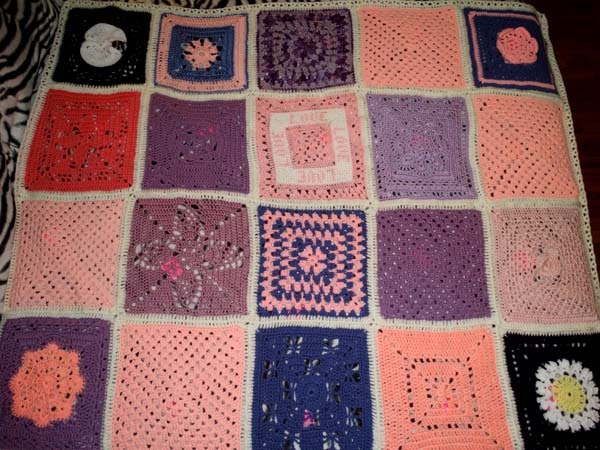 oh yes, I was sure to include a note explaining that a wonderful group of ladies contributed the squares and were thinking and praying for her while they worked and that they hoped it brought her a bit of comfort. as the picture is , I see yours kittyloverdeb, first row, fifth square, third row, third square, yes?? Guess it would help if I remembered which squares I sent! I got the package today. 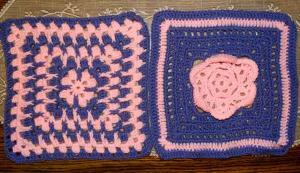 You are truly amazing as are the sweet ladies that helped make the squares. Please tell all of them MANY THANKS from me. Thank you for all the prayers and thoughtfulness of doing this. again, my thanks as well. Thank you for sharing her note. So glad she liked it!